YIN (passive, accepting side). Honor the structure: align creative activities with strategic direction, roadmaps, guiding principles, and organizational charts that provide both the structure and the basis for creative insights. YANG (active, aggressive side). Embrace creative chaos: practice hands-off management, create cross-functional innovation teams, cross-pollinate, experiment, allow the freedom to fail and try again. 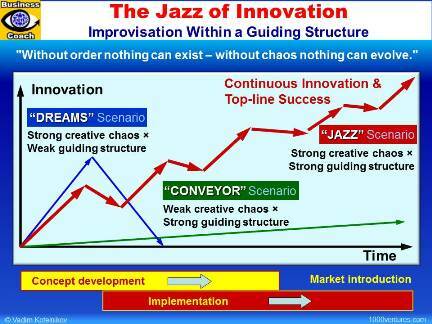 To jazz up your ability to innovate, turn to jazz – create a clear guiding structure, establish a creative chaos environment within this structure to liberate people and trigger accidental discoveries, and encourage improvisation. The structure, as chords do in jazz, serves as a basis for improvisation, experimentations, discoveries and innovation. Management's task is to generate the right climate for creativity, experimentation, and individualism. This climate requires managers to take advantage of that "inherent sloppiness" of innovation – swimming upstream against the innovation myths. 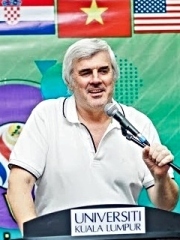 Many corporations are now working with the arts community. Aetna Insurance brought in jazz bassist Michael Gold and his ensemble to teach improvisation. The theory is that kind reactive thinking can help employees handle competition and conflict. It is is important to find the right balance between structure and chaos. You need a certain amount of chaos to be creative but not to the point that you feel overwhelmed by its amount. Too much uncertainty discourages people from mobilizing their best effort. Direction, purpose, and the right amount of structure create freedom. People feel liberated by goals and guidelines.